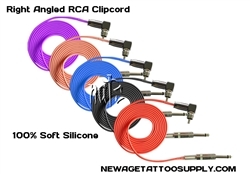 We produced our premium quality Silicone Clip Cord in our facility, All components are of the highest quality. Every connection point were wrapped by plastic pipe to prevent broken. The 90 degree angle allows for the wire to hand straight downwards for added flexibility. Hybird Mono Phone Jack --NOT CHEAP POOR QUALITY. Touch it, Unscrew it, and you will see the difference.